Finally . . . a Complete Form Management Solution! 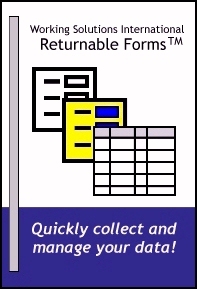 Use the Returnable Forms system to . . .
Open, fill, and save them on any PC with freeware. Do your users download, print out, fill out, and fax back your forms? Do you have to retype all that information into a computer? Do you know how much that process is costing you? Let your users download, fill-out, save and return forms via the Internet. Upon return, the forms can go directly into a database or another process. You can process forms with no human intervention! You don't have time to read piles of resumes -- but you must. Text search engines are sloppy and resume parsing tools still leave you with a cleanup job. You need a real database. Then you see cost estimates for custom web-based solutions and you think, "Forget it. I'll live with the pain." 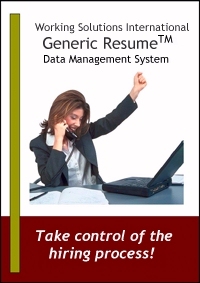 With the Generic Resume Data Management System, you gain unprecedented control over your resume data. Using Generic Resume forms, along with our special processing and reporting tool, you can analyze Generic Resumes with over 30 standard reports, plus an ad-hoc query wizard. See our Reporting Tool video. You can also develop your own selection criteria and save them for future use. Before you spend thousands of dollars on web-based systems or resume parsing tools, try this first.